Evening primrose oil for body massage and aromatherapy. This plant was used by the North American Indian medicine men since time immemorial to make an infusion for healing wounds. Evening primrose oil is exceptionally high in fatty acids, and especially in gamma linolenic acid (GLA) which nutrition wise is important to the body, as it affects many of the enzyme functions in the body. 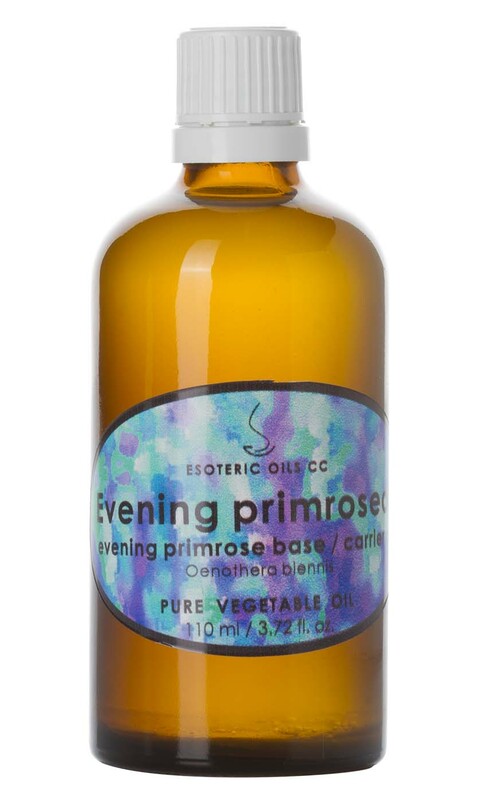 But for our purposes, where evening primrose oil is used as a carrier medium for essential oils, it is important to note that it is an exceptionally fine textured oil and has superb moisturizing properties and used externally it is indicated as effective in helping with eczema, psoriasis, pre-menstrual syndrome (PMS) rheumatoid arthritis as well as weight reduction. It is further purported to reduce hyperactivity in babies and young children when rubbed onto their skin. Since the shelf life of Evening Primrose oil is not that great, it is a good idea to mix it with wheatgerm oil to help it keep longer. Evening primrose oil can be used for facial massage as well, but since it is rather a sticky oil it should be mixed with another oil, such as Grapeseed oil.